Campaign update: Thank you to the 2,969 people who wrote to the senate committee and 3,279 people who wrote their provincial senator to ask them to support Bill S-214. It worked! The bill moved swiftly through committee with full support to move forward to third reading, and has now been passed by the Senate. The bill will now move forward to the House of Commons for the final stages before becoming law. The majority of Canadians support making testing cosmetics (or their ingredients) on animals illegal in Canada. 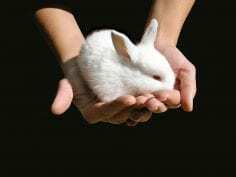 The federal Bill S-214, called the Cruelty-Free Cosmetics Act, amends the Food and Drugs Act to prohibit cosmetic animal testing and the sale of cosmetics developed or manufactured using animal testing. We support initiatives like the Animals in Science Policy Institute and the Canadian Centre for Alternatives to Animal Methods, which work to advance and promote research and testing techniques that don’t use animals.